Other Ingredients: Vegetable Cellulose, Dicalcium Phosphate, Vegetable Stearic Acid. Contains <2% of: Pharmaceutical Glaze, Silica, Vegetable Magnesium Stearate. Zinc Chelated 25mg is rated 5.0 out of 5 by 8. Rated 5 out of 5 by Levi70 from Excellent product, and good availability. Great service, and we always find what we need in stock. Rated 5 out of 5 by JazzyJ17 from Winter need! I dissolve one in my mouth at the 1st sign of a scratchy throat then breathe in through my mouth and out my nose. Rated 5 out of 5 by Nick from Not to much All the other companies offer zinc with 50 milligrams. I was looking for 25 milligrams and this was the only one I could find. Rated 5 out of 5 by ozgirl from great product I take zinc in addition to vitamins to help maximum absorption. 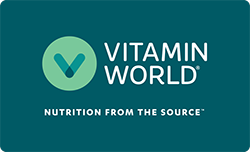 vitamin world offer a great selection of quality products. Rated 5 out of 5 by Anonymous from Beneficial effects, good price For years I have been taking this product to a friend in Europe, because the prices are much higher there.